Islanders goalie Rick DiPietro took a puck off the facemask during practice yesterday, and will not suit up for tonight's game. Doctors have not ruled out a concussion, nor the probability that he'd slip and fall in the parking lot if he were to play. It's another bad break for DiPietro, who had come to practice straight from Nassau University Hospital's burn unit after a curling iron mishap. "He took one high and hard there and it shook him up a little bit," coach Jack Capuano said, as a piano fell on DiPietro in the background. "He looked all right." DiPietro, who lost the starting job during preseason because he was outplayed by Al Montoya and outrun by a hungry bobcat, has not appeared in a game yet this year. 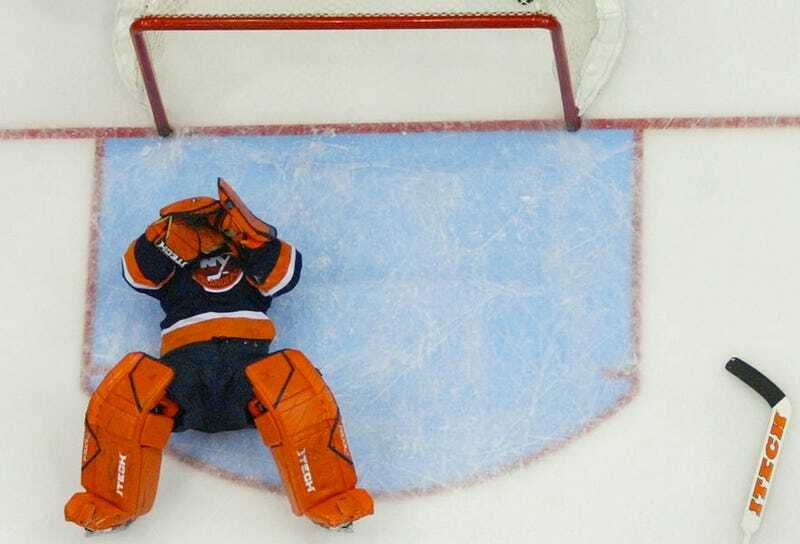 It's unlikely that he will accompany the team on their upcoming Florida road trip, as the state is still pretty sore over the bill from rescuing DiPietro from three separate wells last year.